As those raised to new life in Jesus Christ, we are to lose some things in our lives and gain some things. The Apostle Paul gives his readers a list of attributes that should be first and foremost in the lives of all God’s people. 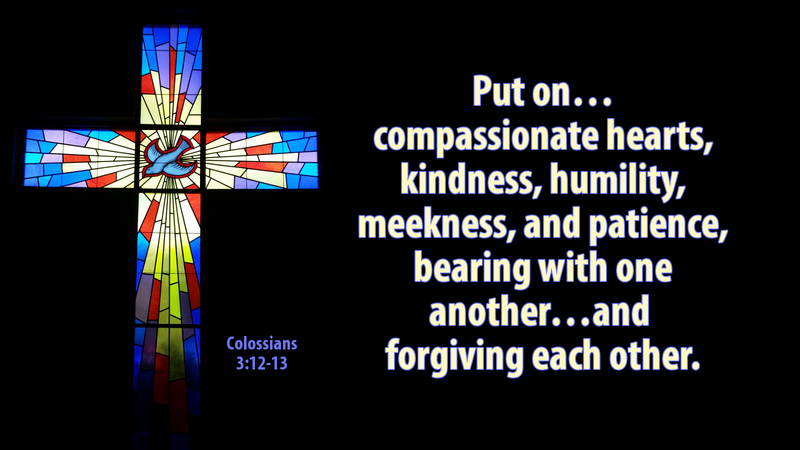 The apostle admonishes us to “put on…compassionate hearts, kindness, humility, meekness, and patience, bearing with one another…and forgiving each other.” However, Paul states, we should strive for love above all. Could you imagine a world filled with individuals actually doing as the apostle proclaims? Many, perhaps most, of the ills of our society could be wiped away in one fell swoop. Many in contemporary society decry Christianity and those who proclaim Christ as Lord and Savior as outdated and not very sophisticated. We are often looked at with disdain and vitriol; however, society takes this view to its own detriment. For the solutions contemporary society needs lay firmly entrenched in Christ and the love and civility that true disciples of Jesus give and proclaim to the world. Prayer: Gracious Father, help us to heed the words of your apostle and put on the things of Christ in our lives. Amen.